A quintessential Lodi wine country story… When things go bad, the old saw goes, you take lemons and turn them into lemonade. Steve Felten, the colorful yet pensive winemaker/proprietor of Klinker Brick Winery, tells us that when he was first forced to turn grapes into wine, he wasn’t exactly thrilled by the prospect. “It started in 1995,” he says, “when we lost our contracts with Gallo, which drove us into making wine to sell on the bulk market… we had to do something with our grapes. After a while, it made sense to start bottling these wines under our own..
f I could make a red wine that was good for your heart A spicy wine worthy of age Would it be enough for your point-scoring lust? Would it help to ease the pain? Make a stain? … I said, I know it’s only Zinfandel, but I like it I said, I know it’s only Zinfandel but I like it, like it, yes, I do Oh, well, I like it… I like it… I like it… – Randall Grahm (parody sung to The Stones’ It’s Only Rock ‘n Roll) Good photography is like good poetry, or verse set to music: .. 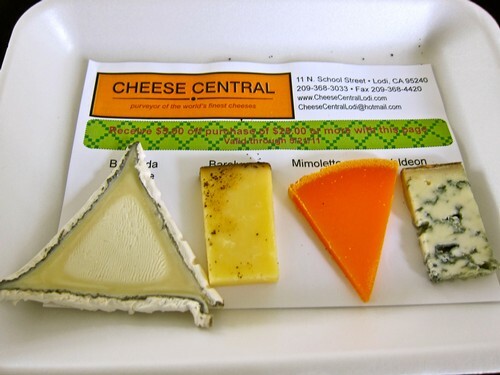 Cheese, like wine, is a product of natural fermentation; and like wine, the variations of end-products are virtually, and deliciously, endless. Yet as incredibly varied as wines and cheeses can be, matching them really comes down to just a few basic, great notions, which was the subject of last weekend’s ZinFest Wine School seminar: entitled Lodi Wine is Cheese Central Friendly, and focusing on four Lodi grown Zinfandels with four unique and delicious cheeses chosen by Cindy Della Monica, proprietor of Downtown Lodi’s bright and shiny, new Cheese Central. The only things outnumbering the delicious variety of Zinfandels and other outstanding Lodi grown wines at the 2011 ZinFest Wine Festival this past Saturday, May 14 were the blissed-out faces of the people who came from far and wide to enjoy this classic modern day Delta celebration. In fact, according to the Lodi News-Sentinel, there were over 6,000 Lodi wine lovers at this year’s ZinFest; up about 47% from last year’s event, which drew about 4,200 zinners. Bokisch Vineyards‘ Markus Bokisch, Lodi’s renowned Spanish grape specialist, was quoted to say that “there were a lot of great questions,” especially “on..
Warming up to Lodi’s ideal BBQ wines… Who doesn’t associate the welcome length of spring days, and incoming sun soaked waves of summer, with barbecue? It’s an American thang, although you might think of it as a perennial return to basic, human, primal instincts; reminding us of one of Woody Allen’s classic quips: Why does man kill? He kills for food, and not only food… frequently there must be a beverage! In our case, preferably a good Lodi grown wine, ideally matched with… Smoky baby back ribs or pulled pork with tomato based barbecued pork Grilled smoky pork with..
Read all about what’s going down music-wise at this Saturday’s ZinFest Wine Festival! The ZinFest Piano Bar Joe Spraker’s awesome piano prowess will ease your zin sippin’ with songs — a little rock, a little country, and a lotta fun! Enjoy a glass of wine at the ZinFest Piano Bar, located in the Wine by the Glass corner between the Main Stage and the Mokelumne River. Strolling musical hijinks by Snap Jackson & the Knock on Wood Players There’s nothing like hot pickin’, foot stompin’ bluegrass to get the blood and spirits rolling, and Snap Jackson & the Knock on..
Plan your ZinFest wines ahead! Understatement of the year: there will be a lot of terrific wines to taste at the 2011 Lodi ZinFest Wine Festival on Saturday, May 14 (12-6 PM) at Lodi Lake Park. Over 250 of them, produced by over 50 participating wineries. Therefore it might be a good idea to plan ahead, and save your palate for the wines you’d really like to try. To help you make those plans, here is a list of wines you will see at the Saturday ZinFest, along with a few insights and average retail prices: Gnarly Head – It’s official, Gnarly Head makes the..